(NC)- Nothing beats a cup of hot cocoa or a glass of eggnog after a busy day of tobogganing or building a snowman – and an even better way to enjoy it is with a decorative coaster. 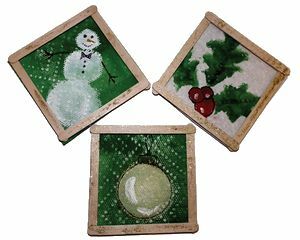 Kids can whip up these holiday coasters in no time, and part of the fun is making them any size or shape imaginable. They make great gifts for grandparents and other family members. Making crafts can be messy work, especially where there is paint involved, but the more creative and messier this activity can get, the better it is. 1. Fold one sheet of Bounty paper towel in half and cut down the middle. 2. Take one half of this sheet and fold it in half into a square. 3. Decorate this square with paint or however you want to decorate it, i.e. with glitter, painted figures or stickers. 5. Apply glue to cardboard and place dried paper towel on top of the cardboard. 6. Once the paper towel has adhered to the cardboard, cut it down to size. This is where you can be creative and cut out festive shapes, like stars, or keep it as a square shape for a traditional coaster. 7. Follow this shape with popsicle sticks, gluing each stick along the edge of the square/shape creating a frame around the paper towel. 8. Decorate the edges with colourful holiday stickers or other decorative items like sparkly sequins and glitter. 9. Paint and glue can be messy. To help with the clean-up, wipe down all surfaces with Bounty paper towels – they have the strength, absorbency, and cloth-like durability to clean up the mess with ease. More great craft ideas can be found online at BountyTowels.com.